The first days stage had the official name “Sudetenlandstrecke” It ran from Salzburg over Passau up to close to Krumau, where the lunchtime checkpoint had been established at the “Pötschmühle”Here, at the outermost part of the leg, was a hefty off road section, which could also be seen by the fact, that this was the slowest section of the day with only 33 km/h. In return, the owners of the paper mill did dish up an excellent lunch to the riders. In the large auditorium, the tables were festively decorated, and the riders welcomed it. The way back over Linz at the Danube then again brought some narrow forest tracks, mud and stone. But, in total, it had not been too bad. The biggest experience of the first day had been, that loose gravel doesn’t have the same frictional coefficient as a nice rough asphaltic surface, and a lot of people already had gone to the ground. As always, this six days trial generated a new “technical term”. It came from the “great creator of new terms”, our national rider Otto Sensburg, who always is creating gorgeous new terms at such opportunities, against him ChriusFrom then on, the riders said, when they had gone into hedges or onto the ground: “da hat’s mi überlisted” [there it did outwit me]. And that is a pretty figurative saying. That day it did outwit many riders, this always happens at the beginning of a six days trial, as one didn’t find ones speed, yet. Here at the Ostmark, with its dust and gravel and the never ending bends, it’s something special. The disease of punctures started right from the first day on. Pohl from Werningerode had three of them, and he was not able to regain the lost time completely within the allowed time. It was a nasty misfortune to loose the gold medal right at the first day due to this one point, especially as this remained the only one. For Pohl it had been a small tack the first time, the second time a real carpenters nail. Riders always help each other. As one rider already had no inner tube left, he got one from a comrade. The other one was in a hurry, so, with the buckle of his belt he ripped a tear into the spare tube, when taking the tube from his belt, of course without noticing this mishap, and then he rode away. The poor rider stood there with a spare tube with a tear, but quickly he had hoisted it as a “distress flag” and did wave to a Wehrmacht outfit with the tube. The passenger of the outfit did get it at once, and threw a spare tube to him, without stopping. Of course I don’t know anymore, to whom this happened, and who the rider of the army outfit was, this might be seen as outside assistance! As a lesson for those who ride such events: The belt is not the correct place for spare tubes, they should be carried in separate bags. 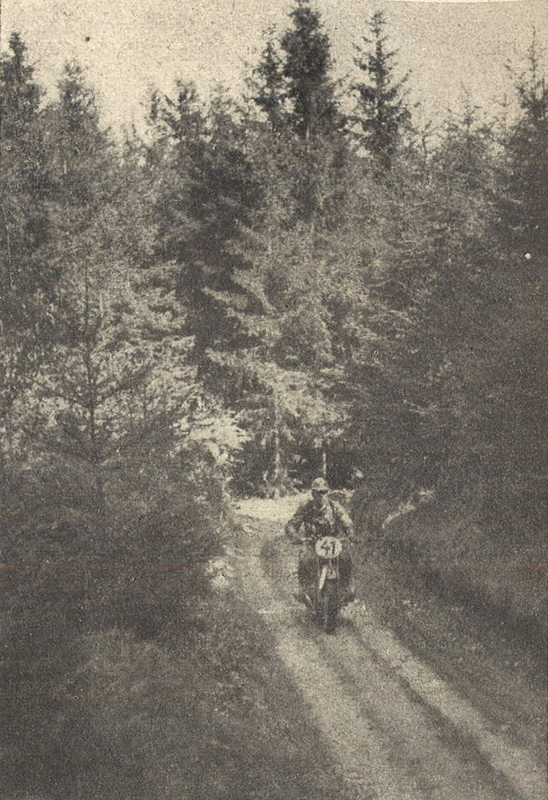 By the way, Otto Sensburg also had a puncture the first day. During the previous six days trial, after the third puncture he had put the “evildoer” into the pocket [as a talisman] , and from that moment on he had no further punctures during that event. So, this time he already put the first one into his pocket, if it did work out this time, I can’t tell. There were a lot of defects already on the first day, and a number of retirements, too. The English private riders lost a whole clutch of men, but also the Italians and we did lose some riders. 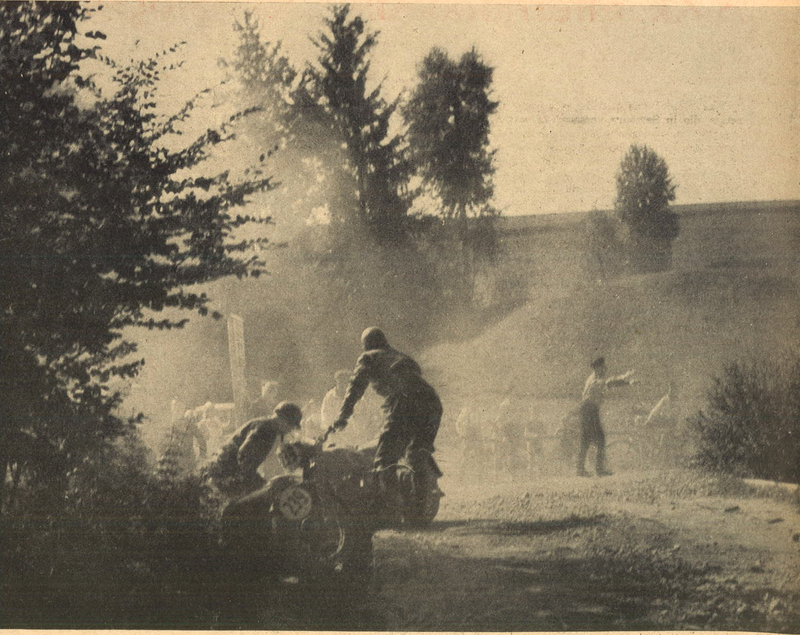 Anyhow, the affected English riders were more or less unknown people, who may not have been aware what a six days trial in Germany’s mountains stands for. Within the retired Germans was Hubertus Klett from Berlin, and the normally very good riding Herrmann on his small DKW 125 cc. Unfortunately, we do not always get information about the reasons for retiring. On Herrmann’s motorcycle, for example, the cylinder head had been distorted during assembly, so that it blew out. Another promising competitor, Eisner from the DDAC had been unlucky, as a wire from the condenser had come loose. He pushed his bike six kilometers to a workshop, where, with adequate devices, the problem could be found and fixed. Anyhow, this brought fifty seven points on his account. For the rest, Eisner did attract attention several times, as he has been fantastically fast with his 125 cc from the Auto Union. Anyhow there is the rumor, that he already had outpaced a man like Mundhenke in the Ostpreussen- Fahrt in the offroad sections. Another unfortunate loss for us was the retirement of Döbereiner from the DDAC on a BMW outfit. At a parking space, he had to do a repair, and for that he had taken a drilling machine from a service car. The technical commissars interpreted this as outside assistance, so the DDAC team withdrew the rider. In contradiction to the opinion of the German sports commissar, the English didn’t agree, that the act of providing a drilling machine was outside assistance. But, the German organisers wanted to show their opinion was right in the beginning and avoid a long debate. After all, this shows clearly the need to check and discuss the regulations in this case, as well as in the case of the absurd interpretation concerning the absolute time for the vase teams. Fifteen total losses on the first day. Six of them were from England. Between the retired riders unfortunately also was the excellently riding Hauptmann Jakobi from the Luftwaffe, who did break a cylinder off during a minor fall, it had only been a slide. If you are unlucky, it may happen this way, normally one can drop the BMW onto the side even with high speed, without anything happening. The most important thing was, that all sixteen riders competing for the international trophy did stay without points, the Italian B-team, competing for the silver vase, took fourteen points. In the fight for the Hühnlein trophy and the Bowmaker trophy, most teams were without points. Day two to follow soon!